Over the past two decades Nachtdigital has become Europe’s most idiosyncratic and unconditionally loved festival for music that has its roots both in the night club as well as listening sessions. On Friday November 23rd we’re hosting their takeover on two floors with Steffen Bennemann, Eva Porating, Bufiman and many more. Playing on the main floor will be Steffen Bennemann, a versatile DJ who is also responsible for the many great bookings that shaped the sonic nature of Nachtdigital. Also on the bill is Bufiman aka Wolf Müller aka Jan Schulte, one of the most exciting names in club scene of today who makes music that sounds both German and tropical. Warming up will be our resident Moreti with a penchant for adventurous music. 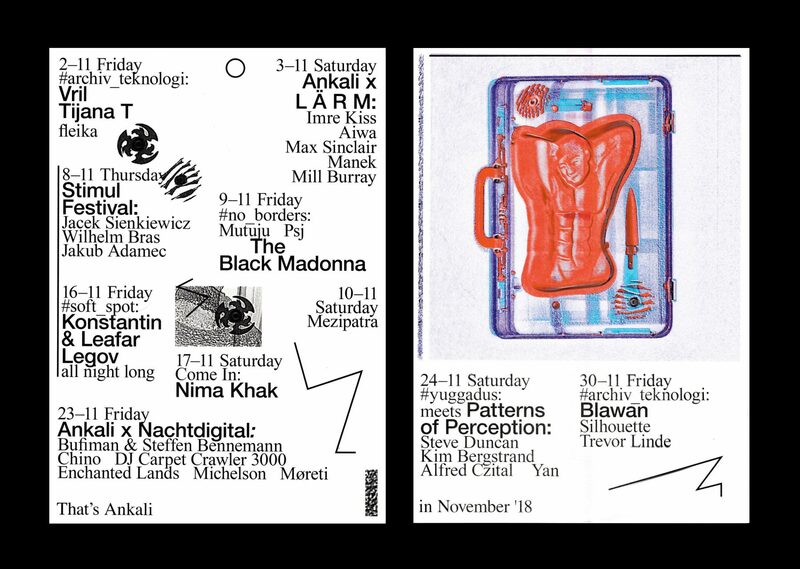 Ambient stage will also be open with two Leipzig-based artists to perform: Michelson will play a live while Dj Carpet Crawler 3000 will play a DJ set. Also on the bill is Eva Porating, a Prague-based sonic explorer.